First hardcover edition of this landmark of modern fantasy. Octavo, original black cloth. 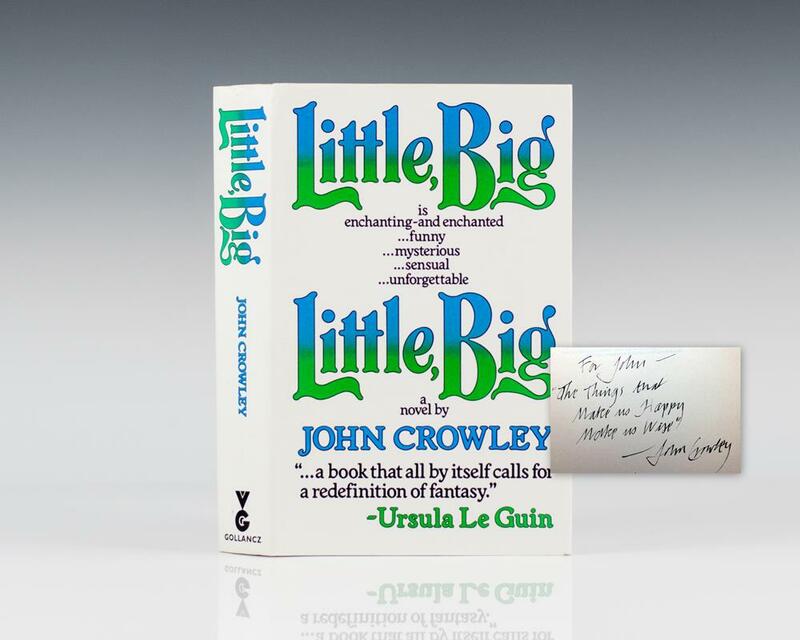 Presentation copy, inscribed by the author on the title page, “For John- The things that make us happy make us wise John Crowley.” Fine in a fine price-clipped dust jacket. Jacket design by Pat Doyle. Photograph of the author by Richard Sutor. A very sharp example of this work. Little, Big is the epic story of Smoky Barnable, an anonymous young man who travels by foot from the City to a place called Edgewoodnot found on any mapto marry Daily Alice Drinkawater, as was prophesied. It is the story of four generations of a singular family, living in a house that is many houses on the magical border of an otherworld. ''A book that all by itself calls for a redefinition of fantasy'' (Ursula K. Le Guin). "A literate, touching and unassuming masterpiece" (Barron).